About three hours ago I left a Chili’s restaurant in Santa Clara, California. After saying goodbye to some friends, I walked to my rental car only to find a window had been busted. My heart sank into my gut as I realized my backpack was gone. I am a victim of theft. My stuff is gone. A laptop. A passport. Cards and ID’s. A notebook full of great ideas. 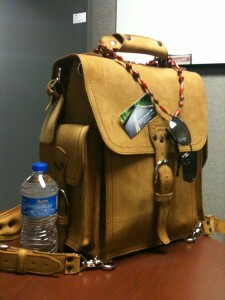 My beloved Saddleback Leather Backpack. Even a stuffed monkey that’s traveled all over the country with me. It hurts and I’ve got a lot of work to do now that this stuff is gone. But it’s just stuff, even the emotional items that can’t be covered by insurance. Looking back now, I’m thankful that I wasn’t robbed at gunpoint. I wasn’t hurt physically at all. It’s just an inconvenience. I’m thankful that I’m a seasoned traveler and it didn’t send me spinning out of control emotionally. I just called the cops, Hertz (why must they flag their cars with bar codes? ), my bank and headed to get a new car after the cops were done taking my report and finger prints (really good prints, too!). No, I’m not really a victim here. I’m not going to act like one at least. The real victim is the person who stole my stuff. They will have to live with themselves for having done it (and they will have to explain it one day). Maybe they were desperate. Maybe they’re just scum. I’ll pray for them and still hope they get caught. Because they are the victim of their own actions and getting caught may be the only thing that turns their life around. The truth is we are all a victim of our actions–the product of what we do. What are you becoming because of what you’re doing? Make it something good!